Fasting in Sanskrit is called Upavaasa. Upa means "near" + vaasa means "to stay". Upavaasa therefore means staying near (the Lord), meaning the attainment of close mental proximity with the Lord. Most devout Indians fast regularly or on special occasions like festivals. On such days they do not eat at all, eat once or make do with fruits or a special diet of simple food. Then what has upavaasa to do with food? According to Hindu philosophy, food means satisfaction of the sense organs, and to starve the senses means to elevates them to contemplation. Fasting in Hinduism, is a method to attain control over one's desires and senses for the sake of spiritual gain. Doing it for a cause has always strengthened people's minds to attain their goals. Fasting in Hinduism indicates the denial of the physical needs of the body for the sake of spiritual gains. According to the scriptures, fasting helps create an attunement with the Absolute by establishing a harmonious relationship between the body and the soul. This is thought to be imperative for the well being of a human being as it nourishes both his/her physical and spiritual demands. Hindus believe it is not easy to unceasingly pursue the path of spirituality in one's daily life. We are harangued by a lot of considerations, and worldly indulgences do not allow us to concentrate on spiritual attainment. Therefore a worshipper must strive to impose restrains on himself/herself to get his mind focused. And one form of restraint is fasting. A lot of our time and energy is spent in procuring food items, preparing, cooking, eating and digesting food. Certain food types make our minds dull and agitated. Hence on certain days man decides to save time and conserve his energy by eating either simple, light food or totally abstaining from eating so that his mind becomes alert and pure. The mind, otherwise pre-occupied by the thought of food, now entertains noble thoughts and stays with the Lord. Since it is a self-imposed form of discipline it is usually adhered to with joy. Also every system needs a break and an overhaul to work at its best. Rest and a change of diet during fasting is very good for the digestive system and the entire body. The more you indulge the senses, the more they make their demands. Fasting helps us to cultivate control over our senses, sublimate our desires and guide our minds to be poised and at peace. Fasting should not make us weak, irritable or create an urge to indulge later. This happens when there is no noble goal behind fasting. The Bhagavad-Gita urges us to eat appropriately - neither too less nor too much - yukta-aahaara and to eat simple, pure and healthy food (a saatvik diet) even when not fasting. 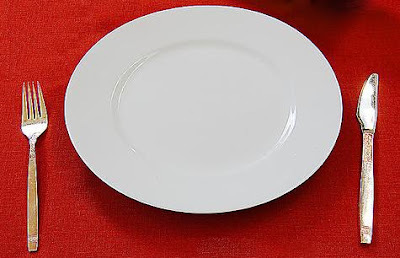 • A common fasting ritual may mean avoidance of foods like fish and meat for a couple of days (for non-vegetarians). Most Hindus abstain from eating such foods for one or more days. • Moderate fasting involves avoiding solids and following a liquid diet consisting of vegetable or fruit juices. This fasting ritual is generally followed during festivals. • Some follow a strict fasting ritual by taking only water or avoiding any liquids for a set number of days. The Karva Chauth ritual among women is the best example of such kind of fasting. · Hindus fast on certain days of the month such as Purnima (full moon) and Ekadasi (the 11th day of the fortnight). · Certain days of the week is also marked for fasting, depending on individual choices and on one's favorite god and goddess. On Saturday, people fast to appease the god of that day, Shani or Saturn. Some fast on Tuesdays the auspicious day for Hanuman, the monkey God. On Fridays devotees of the goddess Santoshi Mata abstain from taking anything citric. 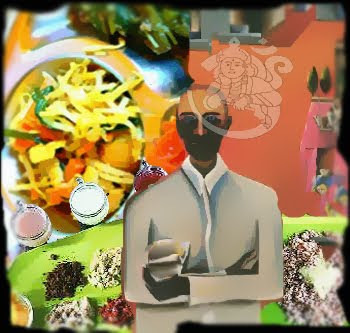 · Fasting at festivals is common. Hindus all over India observe fast on festivals like Navaratri, Shivratri and Karwa Chauth. Navaratri is a festival when people fast for nine days. Hindus in West Bengal fast on Ashtami, the eighth day of the festival of Durga Puja. · Fasting can also mean abstaining from taking certain things, either for religious reason or for the sake of good health. For instance, some people refrain from taking salt on particular days. It is common knowledge that excess salt and sodium causes hypertention or elevation of blood pressure. · Another common kind of fast is to forego taking cereals when only fruits are eaten. Such a diet is known as phalahar. The underlying principle behind fasting is to be found in Ayurveda. This ancient Indian medical system sees the basic cause of many diseases as the accumulation of toxic materials in the digestive system. Regular cleansing of toxic materials keeps one healthy. By fasting, the digestive organs get rest and all body mechanisms are cleansed and corrected. Since the human body, as explained by Ayurveda, is composed of 80% liquid and 20% solid, like the earth, the gravitational force of the moon affects the fluid contents of the body. It causes emotional imbalances in the body, making some people tense, irritable and violent. Fasting acts as antidote, for it lowers the acid content in the body which helps people to retain their sanity. Fasting controls passion. It checks the emotions. It controls the senses also. It is a great penance. It purifies the mind and the heart. It destroys a multitude of sins. Fasting controls the tongue in particular which is the deadliest enemy of man. Fasting overhauls the respiratory, circulatory, digestive and urinary systems. It destroys all the impurities of the body and all sorts of poisons. It eliminates uric acid deposits. Just as impure gold is rendered pure by melting it in the crucible again and again, so also this impure mind is rendered purer by repeated fasting. Fasting is one of the ten canons of Yoga. However, avoid excessive fasting. It will produce weakness. Use your common sense. If you cannot fast for the full twenty-four hours, at least fast for 10-12 hours and then take some milk and fruit. Gradually increase your fast to 15 hours and then up to 24 hours. Fasting makes a man strong, both spiritually and mentally. Complete fasting helps to control sleep. Taking recourse to tea to control sleep is not desirable. You will not gain any spiritual strength if you depend on an external agent. During fasting avoid all company. Live alone. Utilise your time in Sadhana. When breaking a fast do not take a heavy meal or a heavy food that is hard to digest. Milk or some fruit juice is beneficial. it is advised in ayurveda to avoid taking fruit and milk together, you might want to impose this statement in this article. To maintain authenticity of this article. Hinduism is a totally stupid & a screwed up religion.